We love self made pickled and salty stuff be it herb pesto of all kind like parsley pesto or wild garlic pesto, or chutneys and sauces like the hot bell pepper sauce. It is more probable that we fill a glas jar with something home made salty and hearty than with self made jam or marmalade. My personal culinary highlight of homemade food 2013 is to be found in this corner of the recipe book. I love to marinate goat cheese, I do this several times during summer. I like to combine what comes to my mind, if there is goat cheese or feta in the fridge and some oil I can start, I like to add herbs, olives, chilli, pepper, capers, shalotts, spring onions or normal onion, add some vinegar or leave it out. I like to match and mix, leave it a few days in the fridge and at many occasions is a little gift, a companion to a BBQ at friends, at parties or to say thank you. Even after years friends and family like to get one of my marinated cheeses and very often it is eaten straight away. For this recipe I took no goat cheese, yet a diary product that is even more often put in your shopping basket: Quark, or for italian-lovers Ricotta. A thousand times better than cream cheese with its many supplements I like to use pure quark. Be it to make quark dumplings, quick quark puff pastry or herb spread. If there is quark in the fridge I can easily mix it up to a full meal, nice snack or delicious dessert. Gorgeous plain and totally natural, only containing what needs to contain: pure quark. If one uses a special ingredient that frequently one thinks to know everything about it – I was so wrong. I heard it "en passant": marinated quark balls. And then in the evening there was some time and I started to arrange chilli peppers, dried herbs. Then I searched for jam jars, remembering that with marinated goat cheese I like especially big preserving jars. 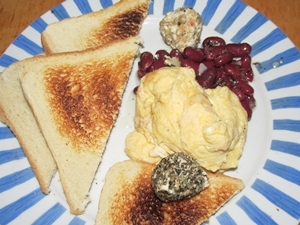 I did a quick check online: for quark balls recipes, I found many sweet quark pastries, searching for "marinated quark balls" did not take me anywhere either and marinated ricotta balls recipes did not string a cord for what I had in mind. Soak and drain the beans, cut garlic cloves roughly. Fill the jars with beans and garlic and salt properly, fill in vinegar. Either fill all the beans in a big jar or divide them to fill the small jars. Roast the sunflower seeds, let cool. Cut or smash the chilli peppers to small pieces or flakes. Wash hands very well (one does not want to accidentally touch one's eye with chilli fingers). Use a mortar to roughly ground the sunflower seeds. Mix sunflower seeds and chilli flakes onto a saucer or a coffee cup. Mix all the herbs onto a saucer or tea cup. Now salt your quark or ricotta. If the quark is to soft and wet, before salting: drain the liquid and leave it in a fine sieve or mesh or in a cloth, so it will lose some more liquid. In the meantime cover the beans with oil. I like to shake the jars frequently, so the flavors can mix better. Take a spoon to form little balls out of the ricotta / quark. In turns cover some of them with herbs and others with seeds-chilli-mix. The perfect size of balls is in between hazelnut and walnut. You will get out 12 to 17 ricotta balls or quark balls. Use a spoon to put the balls on top of the beans. 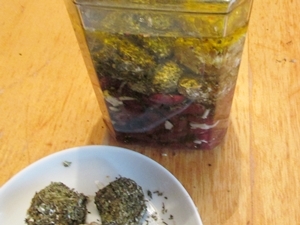 Either put all herb ricotta balls in one jar and all chilli quark balls in another or mix them all up. Leave at least one day in the fridge. The cheese balls make a delicious spread (and if you think of it the fat in the quark and the oil - this is still less than what normal cream cheese carries). Especially on toasted bread, and maybe together with the beans which you could use as spread as well. You can top every green salad with quark cheese balls and beans and turn it into a nice meal. Serving chicken and rice you can add some zing with the fiery chilli ricotta balls which make up for a sauce like chutney. You can serve them as anti-pasta or appetizer before the meal or dip them into tortilla chips. Why I loved these home made marinated quark balls so much? 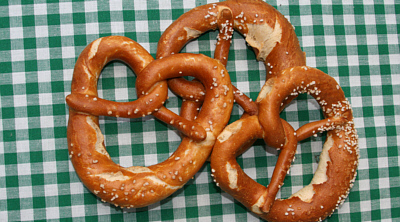 Because they are so simple to make and yet tasteful. 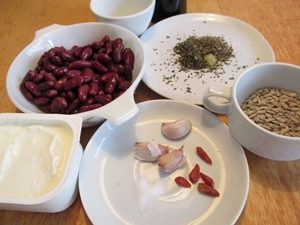 Contrary to marinated goat cheese the quark does take up the taste of the herbs and oil and it blends perfectly. 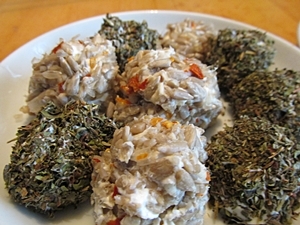 You can vary this recipe, use fresh herbs instead of dry ones, you could of course use goat cream cheese as well. If you don't like beans, leave them aside. The oil is very tasteful and can be used for a salad dressing. Those who like marinated goat cheese do get with this recipe a practical and tasty alternative. If you use a pretty mason jar, arrange the beans and quark balls nicely, use a pretty muffin paper to cover the lid or crochet a lid cover, you have decorated a nice little something into a gift.